Re-inventing Twills- In this workshop take the concept of a twill in all its configurations and learn how to use the treadling of one twill on the threading of another as well as learning how to apply treadling methods to a variety of twills. Six weavers, seven looms, 42 samples and one unexpected bride weaving! A great time was had by all!! The Handweavers’ Guild and Hopewell Weaving teamed up to offer hands-on weaving. 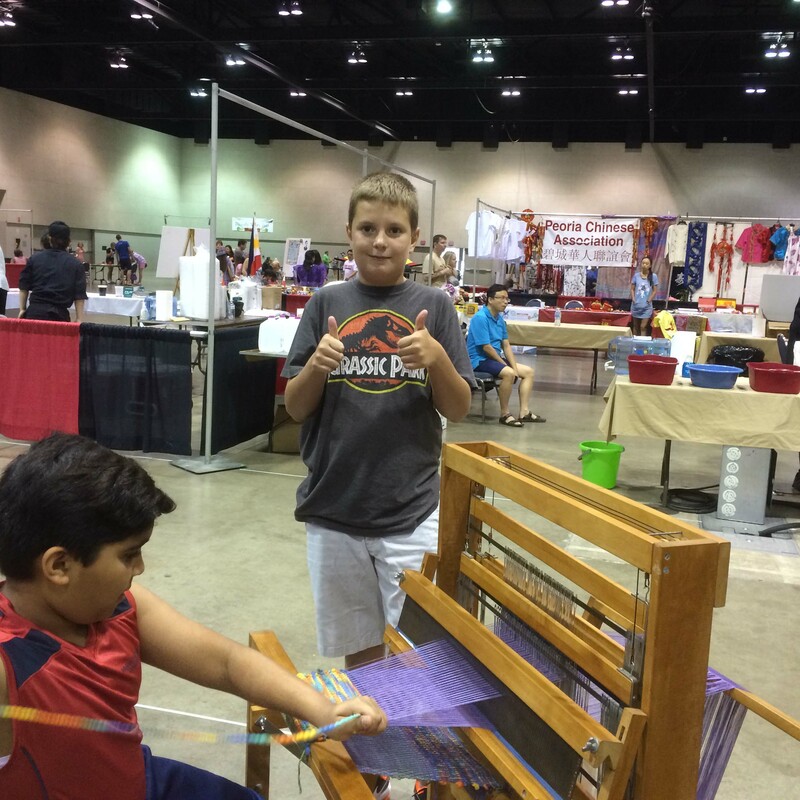 We had a great day with scores of adults and kids weaving on four-harness looms! What a great workshop! Thanks, Robyn, for sharing your knowledge, humor and insights. We hope to see you again in Peoria in the future! On April 11-12, 2015, the Peoria Handweavers’ Guild of Peoria is sponsoring a workshop featuring the nationally known instructor Robyn Spady. The workshop, “Extreme Warp Makeover” is for the beginner to advanced weaving student. In this workshop you will warp your 4-shaft loom in one of 3 different 4 shaft threadings and perform an extreme makeover and weave many different ways….from twill, lace, and overshot to swivel, corduroy, deflected weft, and double-faced. A four-shaft loom is required. Robyn Spady has been weaving for over 40 years. She has taught extensively at seminars and conventions across the United States and written numerous published articles. The cost of the two day workshop is $150 for members of the guild or $175.00 for non-members which includes a one year membership to the Handweavers’ Guild of Peoria. The workshop will be held at the AmericInn in Peoria. We have a block of rooms reserved at the discounted rate of $89.99 (normally $129.99). Breakfast is included and full use of the facilities, including the pool. These rooms will be held until March 11th at this price. The Handweavers’ Guild of Peoria will demonstrate weaving, spinning and other fiber arts. This event is free and open to the public. 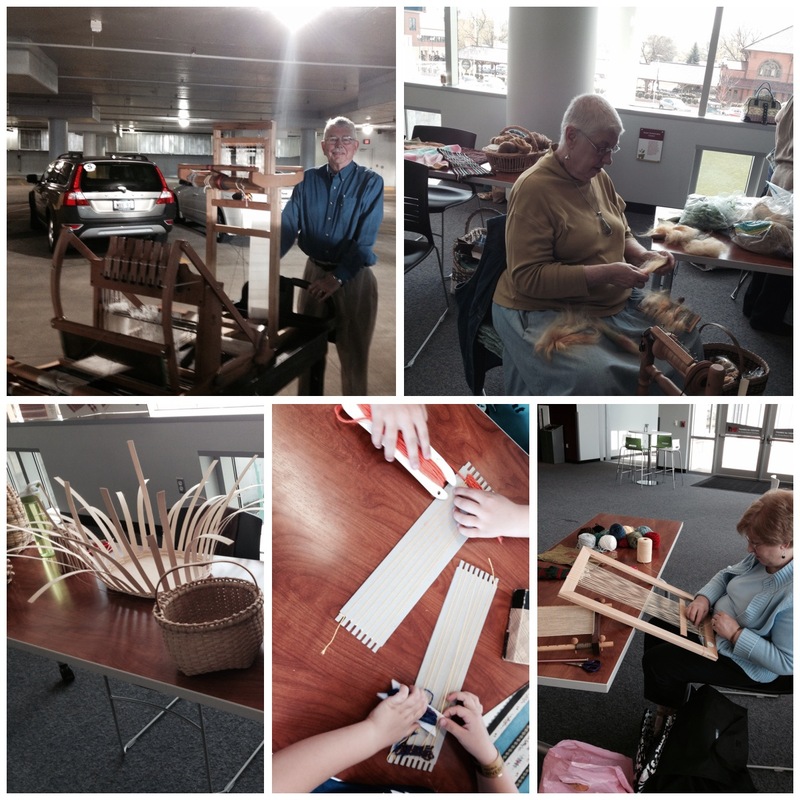 Members demonstrated weaving at spinning at the Riverfront Museum on April 26th. Demonstrations and hands-on activities were offered throughout the day. 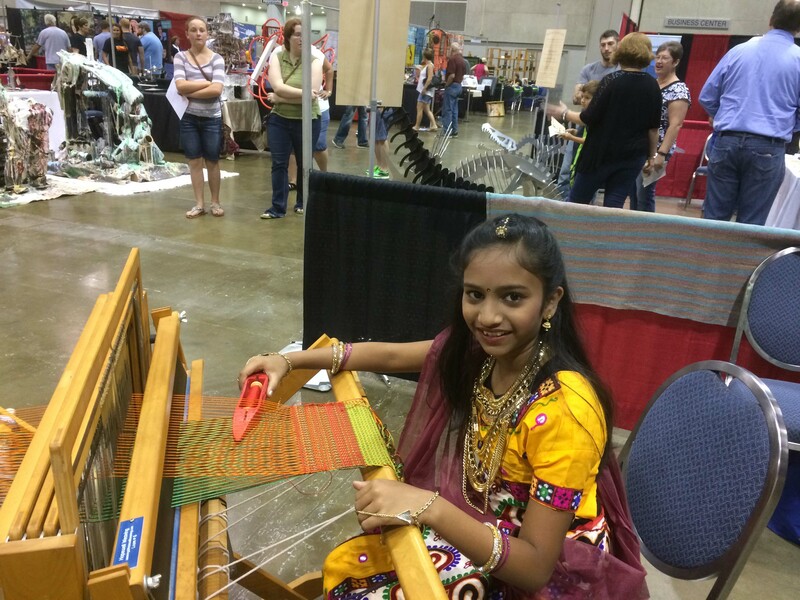 Kids were taught how to weave on a cardboard loom that they could take home with them. People were fascinated with the variety of looms and the process of carding fleece. Times: Friday 6:30 – 9:00 P.M.
Sunday 10:30 A.M. – 2:00 P.M. Cost: $28 plus $10 material fee per participant. Food: Potluck lunch Saturday, Bring your own bag lunch Sunday. Celebrate the culture of the United Kingdom as the Handweaver’s Guild of Peoria gathers to eat, study and perhaps kick up their heels! Our Scarf Workshop was a smashing success! Friday night was spent dying several small items and Saturday we used resist to make beautiful patterns. 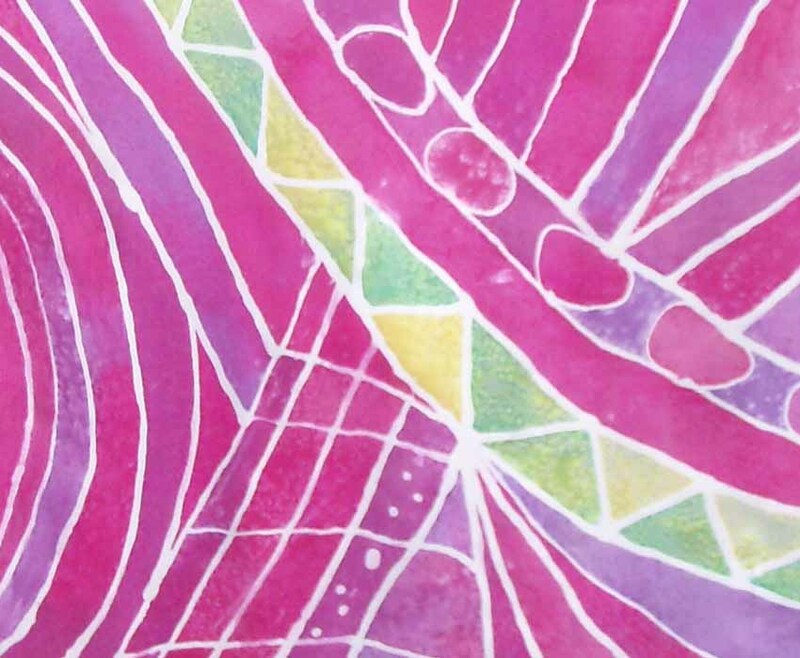 Thanks to our skillful and fun teacher, Karen Snow who led us all to beautiful, creative projects. Email hgp@mchsi.com for more details! 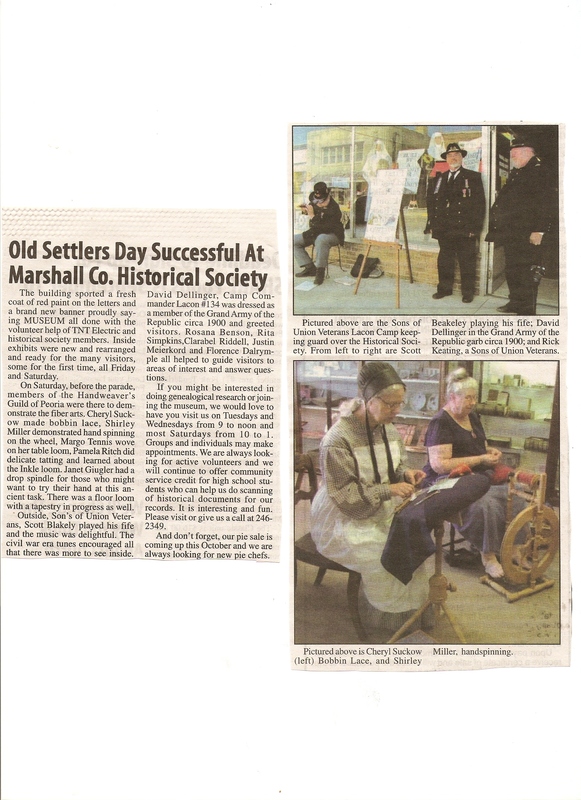 August 27th Old Settlers Day in Lacon found several members of the Handweavers’ Guild of Peoria spinning, weaving and making lace. Here is an article that was in the Lacon Home Journal.